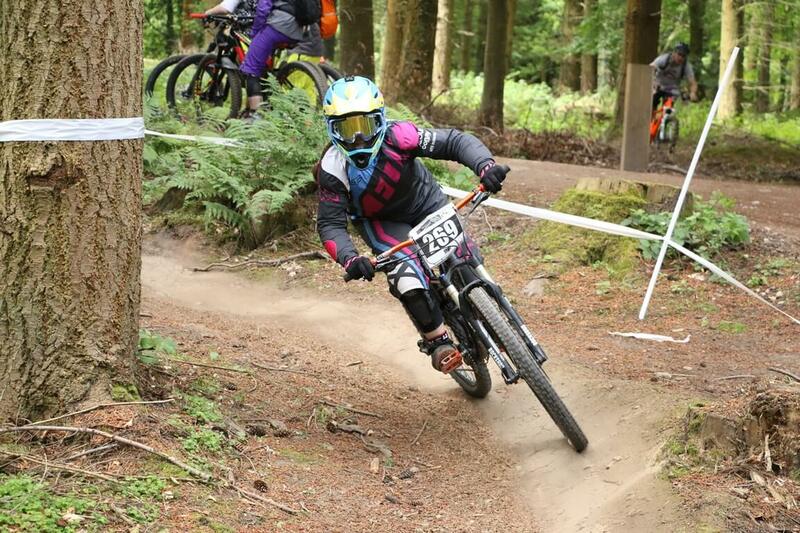 Round 2 of the MIJ summer series was held at the Forest of Dean on Sunday 25th June it was Elin’s second downhill race and her first as part of the Flow MTB race team. All female riders were put into one ladies category so 11 year old Elin was up against some fast riders, but this didn’t faze her! Putting in 2 great race runs she raced into 11th place out of 13. Here’s Elin’s race report. The weather had been dry all week which meant a dry course which I was grateful for as Sheepskull can be very tricky in the wet. On practice day I hit the big root section before the fire road but took the wrong line, I hit a big root and was sent flying over the handlebars, somersaulted and landed in the bomb hole on my feet unhurt! It shook me up so I practised the root section loads until I was happy with my line choice. On race day I met up with my team mate Kate. It was brilliant having team mates there to give support. I did a few practise runs with Kate and decided to have a rest before the race but typical, it started to rain! Kate and I decided we should go back up and run the course again in case there had been any changes and I was pleased it had not affected the course. At the start of the race it was so relaxing being around the other women I forgot to be nervous. On my first race run I hit the dreaded root section as fast as I could. Then I dropped into the bottom section but took an off camber line to avoid the rocks which was a lot smoother. As I got closer to the finish it was exciting to hear the spectators cheering me on and it put a huge smile on my face. I finished in 10th position. On my second run I pedalled a lot more and my legs were so tired by the last section. As I came around the last berm to pedal towards a jump my foot slipped off the pedal and I just managed to get it back on as I hit the jump, phew! I finished 4 seconds faster than my first run. I finished in 11th place and was really pleased with a time of 2.13. I had a brilliant weekend and a huge thanks to my team makes Kate and Cory. Can’t wait until the next race.